North American Monotropaceae or mushroom flowers, once considered a small, unique botanical mycotrophic plant family now formally get classified as members of the Heath family (Ericaceae). Nine species in eight separate genera populate forest floors wherever their mushroom hosts flourish. Favorites of many hikers and botanists, their bloom ranges from spring through fall, depending on the species and location. 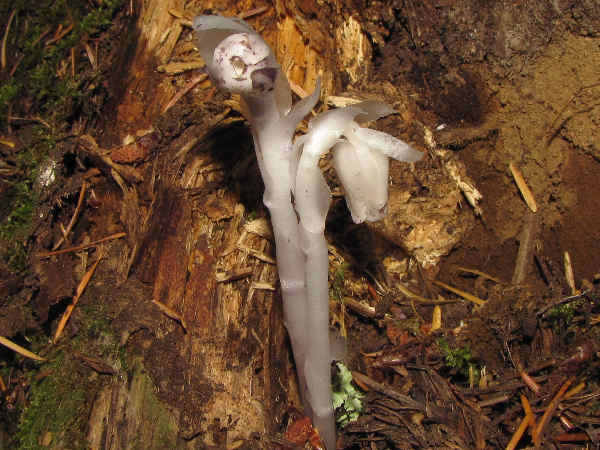 Two species, the Ghost Pipes (Monotropa uniflora), pictured above, and the more colorful Pinesaps (Monotropa hypopithys) pictured second, adapt to forest floors from Alaska in the Northwest to Florida in the Southeast. 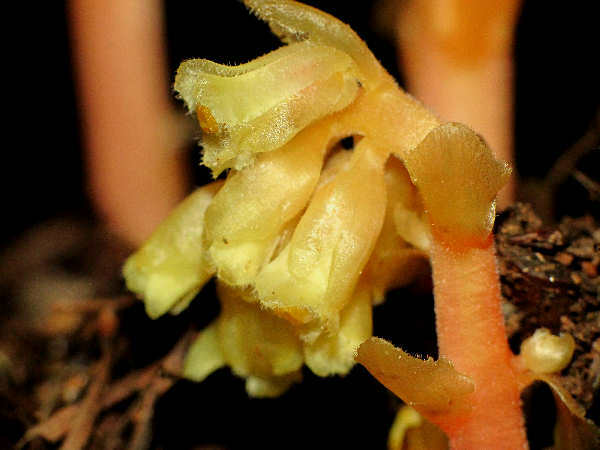 Monotropa adaptability partially explains their evolutionary success. They grow in association with a variety of mycorrhizal fungi, predominantly in the Russulaceae mushroom family. Along with color, flower structure differentiates the plants, with uniflora producing single flower plants and the hypopithys producing multiple flowers on a single stem. 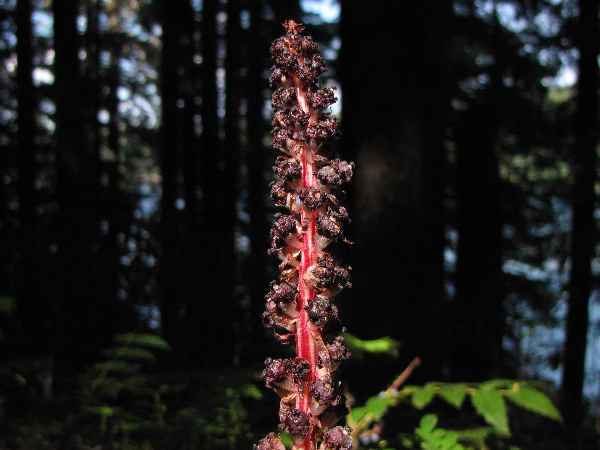 Five Monotropaceae species, sugarstick (Allotropa virgata), the gnome plant (Hemitomes congestum), the California pinefoot (Pityopus californica), fringed pinesap (Pleuricospora fimbriolata) and Snow plant (Sarcodes sanguinea), grow exclusively in western North America. 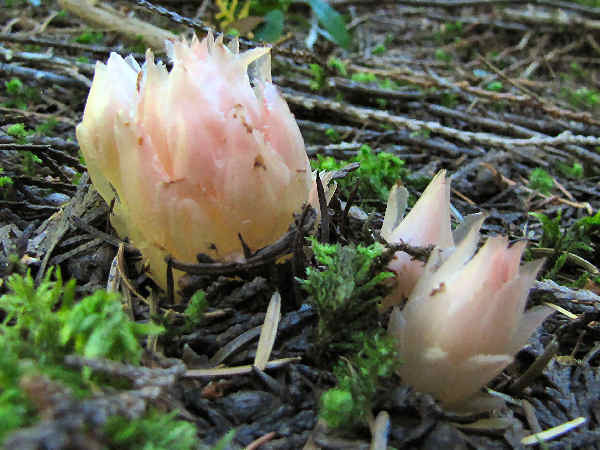 Taking into consideration the exclusively western Monotropaceae species, along with the wider ranging Monotropa species, some regions of the Cascade Mountains in the Northwest host six or seven of the nine Monotropaceae species in a square mile of hiking trails. 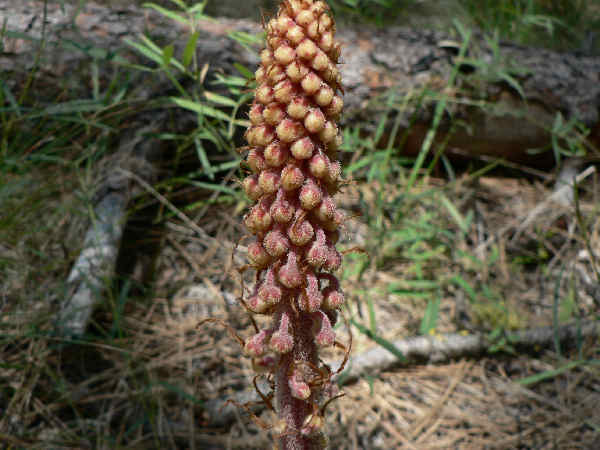 Sweet Pinesap (Monotropsis odorata) grows exclusively in the Southeast, while Woodland Pinedrops (Pterospora andromedea) grow in most North American coniferous forests except for the Southeast. The red and white striped stem of the flowering Sugarstick or Candy-stick (Allotropa virgata) makes it an easily identified plant. When spotted on the forest floor of older growth coniferous forests, mushroom enthusiasts often take notice because the plant grows in association with Matsutake mushrooms (Tricholoma magnivelare). Often botanists discuss mycotrophic plants in terms of nutrient exchange between the host fungi and the plants themselves. Sugarsticks, like all mycotrophic plants return no nutrients to the host fungi. The lack of nutrient exchange sometimes gets interpreted using the formal language of economic rationality. Sugarsticks get described as free riding on the fungi. An ecosystem or long term sustainable development interpretive framework might also help explain the utility of the North American Monotropaceae. For example, the above ground appearance of sugarsticks, might be interpreted as being the mycorrhizal fungi’s visual signal to local fauna announcing the upcoming blooming of the Matsutake mushrooms. Visual signals to local fauna such as chipmunks, who use mushrooms as a food source, doubles the fungi’s above ground spore dispersal network by complimenting it with wind dispersal. A dual spore dispersal network additionally increases the probability of the fungi’s long term sustainable development by gradually extending its range over time. Uncommon within their range, Gnome Plants or Cone Plants (Hemitomes congestum) usually growing about one-half inch above the ground in a shallow, cup like, cluster of tiny flowers. Can gardeners grow Monotropaceae? The short answer is yes. Scientists have already seeded portions of U.S. forest land with seeds from most, if not all North American Monotropaceae. While seed germination success rates were low, scientists successfully documented the mycorrhizal fungi specifically associated with most species. A long answer to the question of garden grown Monotropaceae requires dividing the question into a two part plant and mycorrhizal fungi host project. The presence of the specific mycorrhizal fungi host in the garden area, along with Monotropaceae seeds are both necessary ingredients for growing a Monotropaceae species in the garden. Sugarstick for example, grows exclusively on Tricholoma magnivelare, a fungi unable to be grown in a laboratory setting. The absence of success in cultivating Matsutake mycorrhizal fungi in a laboratory or garden setting makes germinating and growing Sugarsticks in the home garden a practical impossibility. On the other hand, Woodland Pinedrop (Pterospora andromedea) seeds have been successfully germinated in three different Rhizopogon species including Rhizopogon salebrosus. Furthermore, Rhizopogon salebrosus remains a popular mycorrhizal fungi for inoculating tree saplings to encourage root growth. Assuming homeowner access to saplings inoculated with Rhizopogon salebrosus, transplanted saplings surrounded by a sufficiently large Rhizopogon salebrosus presence in the soil provide the necessary ingredients for germinating, and possibly growing Woodland Pinedrops in the garden or yard. The possibility of cultivating a Monotropaceae species needs also be balanced with an awareness that the introduction of mycorrhizal fungi in any area, for any purpose such as commercial mushroom cultivation, soil remediation or plant propagation may invite unintended consequences in the ecosystem.